RAFAEL NADAL: Well, you know, I was practicing very well during all the week. I was for sure nervous. That's normal. It's normal start the tournament like this with some nerves. And what happened today, he didn't help because he played very fast all the time. All the shots, he was trying to do a winner in almost every shot. So it was difficult for me to find the rhythm. Yeah, but it's a positive start winning in straight sets, even if was unbelievable that I won straight sets. But is a victory in straight sets. So happy for the victory. Happy to come back here New York. I think I didn't play that bad. But the mental part was positive tonight. The tennis for sure can improve. I have to play a little bit more inside the court. But I am confident I can do it. Q. Are you concerned at all about your serve? You were broken five times the whole tournament 2010, six times tonight. 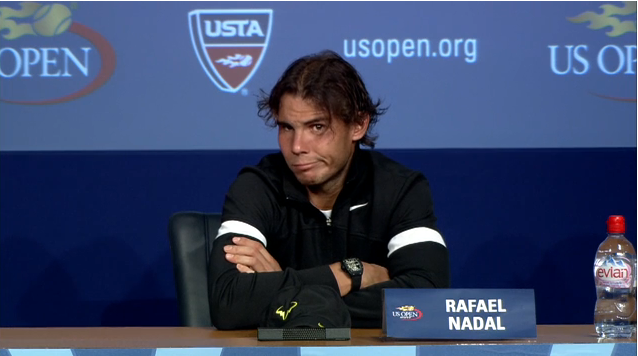 RAFAEL NADAL: Is impossible to win this year (laughter). No, I am joking. Sure, the serve was important part of my game last year. But the serve help me a lot to win the tournament, but I won the tournament because I was playing fantastic from the baseline. So my game is from the baseline. I never gonna be a big, you know my serve never going to be huge, I know that. But I can improve my serve, and that is what I am doing. Today I lost my serve six times. In my opinion, was not a fault of my serve. You know, was a fault that he was returning very fast all the time. Sometimes I hit the very good serves, 126, 128, and the ball came back unbelievable fast, no? And, you know, I was enough fast I was not enough fast to play aggressive with the forehand. That's because I was a little bit more nervous. But that's the sport; that's the game. I lost six time the serve. Was not my serve, the fault. Q. So you're not worried? RAFAEL NADAL: You know, I cannot be worried today having two days off winning the first match. If I won today, I cannot go to sleep tonight, tomorrow, I not worried. I happy I'm through. I didn't play a lot this summer. You know, I have a fantastic week of practice here. I was practicing really well, much better than in the previous tournaments. It's normal start like this. It's normal start with doubts, with more nervous. The confidence didn't came like this (snapping fingers). You have to find your confidence. The confidence is spending hours on court, competing better, winning matches. Today was one of the matches. I am very happy to be through, and I am happy to be playing better. We'll see if I am ready to make this improve that I will make. Q. How do you find the court? Federer said they are slow. What is your impression? RAFAEL NADAL: I cannot say. I see the court very similar than last year. That's my feeling. But everybody have a different feeling. When you arrive to one tournament, for one court the court is very fast, for another court the court is not that fast. It depends how you're playing and your feelings. And your feelings are not the same every year. So your opinion on how you see the court depends how you're moving, how you're playing, you know. My feeling is the same. Q. How are you moving and how are you playing then? RAFAEL NADAL: I already talk about that 10 minutes. I said I had fantastic week of practice. Today I played with more nerves. Today I played nervous. That's normal thing. You know, I lost few matches this summer. Even if I had a fantastic season before, had tough loses in finals. But this summer I didn't play a lot, so the confidence is not arriving fast. Especially if you don't win a lot of matches in the last tournaments, even if I was practicing very well, for sure that's not enough. Important thing is have victories like I had tonight. Q. You play against Nicolas Mahut next round. Are you ready to play 10 hours against him? RAFAEL NADAL: I am not ready to play 10 hours. That's not going to happen. That's only in very special situations, in very special matches between two big serves. He will break me before. Q. How much does it help your confidence that tonight on the biggest points you came up with your best shots? RAFAEL NADAL: I had a few good passing shots in important moments and to save set points in the second. You know, in the match point, I had a very good passing shot, too. In the breakpoint in the first set, I think backhand down the line I had a good one, too. I hit it, a good shots. I think I hit a good shots but not enough, no? I think I hit a fantastic shots for a moments, but I didn't hit six, seven, eight points straight good shots, moving around, hitting forehands. The opponent didn't help me. That's the true. I didn't play like this. For sure, always when you are finding problems, always the problem is here; it's not the opponent. But for sure the opponent was playing very fast. You know, the ball never came like this. The ball always came like this (indicating very fast). It was difficult to try to hit four, five forehands in a row. Especially when you are a little bit nervous, your movements are a little bit slower. That's what happened. Q. You said the other day, talking about Cincinnati, that you didn't want to discuss the backhand because you had the burns on your fingers. Tonight it seemed like you were having problems getting some length on the two handed backhand. Are the fingers okay? RAFAEL NADAL: The fingers are much better. Is not hundred percent okay, but are much better. So the problem is not the blisters right now. I am happy how I hit the backhand. Is just the problem of position to hit the backhand more inside the court, to play the backhand with a little bit more confidence, because I was doing really well during the previous week. Hopefully for next match I will do it much better. That's the way. The people forgets a lot of things, but last year my first match was really bad. That's the true, even if I didn't lose my serve, but I played bad against a similar opponent than today. He played very fast. Was different situation, but is very difficult to start one tournament playing very well from beginning. I am not saying that I will play fantastic next days, but I am confident that I can do it better. Q. You always put on awful lot into your practice sessions. Do you think you perhaps practice with even greater intensity and longer before this championship than you have for many championships just because you needed to get some more time on the court? RAFAEL NADAL: My feeling was my movements during Montréal and Cincinnati wasn't perfect, and that was the biggest issue for me, no, to improve. And I practiced hard. I practiced with positive attitude all the moments. Seriously, I'm very happy. I arrived here, I started to practice here on Monday, and since the first day that I was practice here, my feelings was much better than the previous tournaments. I think the conditions help me little bit more. But, you know, I didn't win a tournament. I didn't win a lot of matches. But I practiced during that two weeks with top level players. So that's, for sure, help me to be in better conditions to arrive here. And, for sure, that's going to improve. But I practiced at home three days, four days maximum before Montréal. Always is tough at the beginning. Q. It hasn't been that long time wise since you won Roland Garros. You've talked a lot about confidence. If you think back to how confident you felt after that, where you were coming in here, was it a radical difference? RAFAEL NADAL: You know, one player did fantastic probably very difficult to do it better was Djokovic. And I did very well. That's what happened. The confidence is just because I didn't practice enough, is just because for sure when you are having tough loses like the final of Wimbledon, your illusion goes down a little bit and you need to recuperate that after. I am playing with very high illusion here, high motivation. But, you know, I need time. Everybody knows it's not easy to lose five finals this year. And at the same time I am happy that even if I was losing that finals, I was keep doing well. I lost the final, but next week I was in another final and next week in another final. Wasn't big mental problem for me. I accepted really well the loses during the season. But for sure after Wimbledon I had to stop for one month, not play tennis. The illusion always after long season for me since Indian Wells to Wimbledon, you know, is the body stays tired, the mental part stays tired. I played all the matches during this part of the season, all the finals, and losing a few ones. So the mental part is tough and the physical part is tough, too. That's why I had to stop and I need to come back. And that's what I am doing.